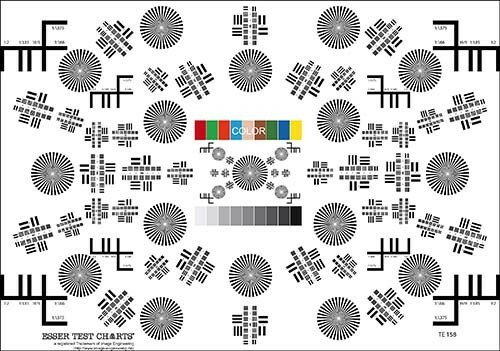 [TE158] Cine Test Chart with format markings for 1:1375 (35 mm), 1:166 (S16), 16:9 (HDTV), 1:185,1:2. Resolution power is given for three different enlargements은 필름 카메라의 이미지 품질을 평가하기 위해 설계되었으며 다양한 형식의 카메라에 사용할 수 있습니다. 섹터 별, 여러 테스트 요소, 선형 그레이 스케일 및 9 개의 테스트 컬러 패치로 구성됩니다.